Cruise also sat down to talk with Corden and Anna Faris, the other guest for the evening. Faris and husband Chris Pratt welcomed a baby together back in 2012. Faris currently stars in Mom, and it was recently announced Pratt will be a guest star on an upcoming episode of the show. Anna Faris also hosts the Anna Faris is Unqualified podcast. Cruise is in theaters this weekend in Jack Reacher: Never Go Back, the second film in the series based on the popular character created by Lee Child. 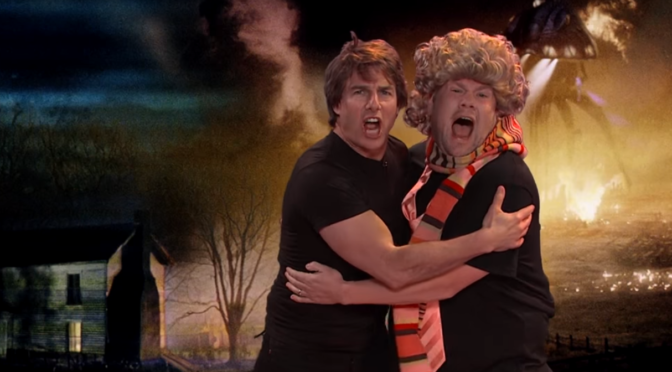 Tom Cruise and James Corden act out Tom Cruise’s film career. Donning bomber jackets, the pair starts with Top Gun, moves to Days of Thunder and goes on from there including the multiple Mission: Impossible movies. Cruise has appeared in roughly 40 films in his career, dating back to Endless Love in 1981. In 2017, audiences will see him in The Mummy and American Made. Tom Cruise acts out his film career with James Corden Cruise also sat down for an interview with Corden. He talked about being a bit of a “problem child” growing up, including “borrowing” a car when he was 12. Anna Faris, also a guest on the show, chimed in that she was pretty sure it was stealing not borrowing. Tom Cruise on The Late Late Show with James Corden Cruise and Faris also talked with Corden about first kisses. The segment included Cruise talking about being a “kissing dummy” for his sister’s friends.